Just about every industry has something in common. Well, besides commercial space, staff, and all that other stuff, you need a good, absorbent industrial cloth. The hospitality industry needs it just as much as the auto mechanic down the street. With TIDDOX's MELTBLOWN OIL ABSORBENT WIPES, you will have a thick, absorbent wipe that is truly multi-purpose. One of the issues our customers have about competing products is the dripping. They use a towel to wipe up a mess and it drips all the way to the garbage can. Inevitably, someone steps in one of the drips and tracks it around the floor. With MELTBLOWN POLYPROPYLENE WIPES, you won’t have that problem. The super-absorbency means the polypropylene fibers grip the liquid or semi-liquid, holding onto it until you either wring it out or throw it away. That’s why we call this cloth the OIL ABSORBENT WIPER, because it will soak up oil, antifreeze, jello, ink, or grease (automotive and cooking) with little trouble. It is also tough enough for all of the scrubbing that needs to be done at your worksite. This cleaning cloth will hold onto solvent without coming apart, allowing you to scrub those down-and-dirty messes. 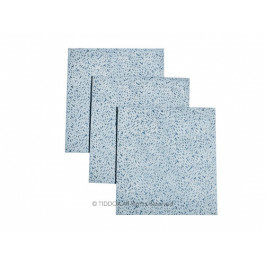 The edges of these thick towels are sealed so you can use these low-lint wipes for surface preparation because they won’t leave excess debris behind on surfaces. These MELTBLOWN DEGREASING WIPES come in packs of 50 towels. There are 12 packs in each carton, so you can place one pack in each workspace. These blue cleaning cloths are disposable and affordable – two of our favorite features! Any manufacturing facility needs these OIL ABSORBENT INDUSTRIAL CLOTHS. They are tough enough to stay together when you’re wiping down sharp edges, but soft enough to polish mirrors and lenses. They are absorbent enough to soak up spills but hold together when you’re cleaning with solvents. Use them on the manufacturing floor to keep spills and leaks contained, or use them in the laboratory for cleaning fine-tolerance tools. Every garage uses the ubiquitous “Bags of Rags”. The TIDDOX AUTOMOTIVE MELTBLOWN OIL ABSORBENT WIPES are a fantastic recycled rag substitute. These thick cloths are more less bulky and more compact and consistent in absorbency and cut/size than T-Shirt rags, and far more effective so that messes are soaked up rather than smeared. Drop one on the puddle under the radiator and it will contain the anti-freeze until you can get back to the mess. TIDDOX's HOSPITALITY DEGREASING WIPES can be found in janitorial closets, behind restaurant bar,s and in chefs' kitchens, because they are favoured as a great multipurpose towel. Housekeeping can use them to shine mirrors or scrub bathtubs and light switches. The barkeeper and busboys can shine glasses and silverware, and the kitchen crew can control spills and shine stainless steel counters. Printers need a special kind of cloth in their job. They need something that is absorbent enough to contain an ink spill, but strong enough to wipe down equipment without leaving debris behind. Try TIDDOX's MELTBLOWN POLYPROPYLENE PRINTERS' TOWELS, and you won’t want any other brand. Painters, also, need a tough, durable cloth that is absorbent enough to soak up paint. You also need a painters cloth that will hold together when you use it with solvents. Order a carton of TIDDOX's PAINTERS' POLYPROPYLENE WIPER PACKS. Try them out, and you won’t want any other disposable cloth in your business.